Some fantastic news has just surfaced for Hootsuite and Instagram users!! YES, Hootsuite does automatically posts to Instagram! 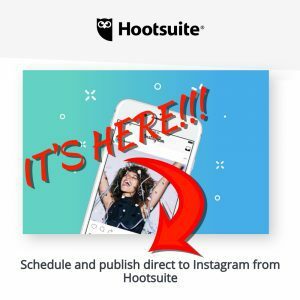 No need for push notifications on your smartphone to complete the process, you can now schedule a photograph or graphic on HootSuite and it will now automatically post to your Instagram account on the date and time of your choice. The best part of this great news is that this feature works for all types of Hootsuite accounts, including the free plan, which allows one user to schedule posts for up to three social media accounts. There are a couple of conditions of using the HootSuite to publish your Instagram posts, one being that you must have a businesses Instagram account (don’t worry if you haven’t, it is easy to switch your account over to a business account), and secondly, it will only publish single pictures, video will still need to be completed via the push notification on your smartphone. Many businesses around the world have been crying out for Instagram scheduling, and I am sure this feature will be extremely useful for many of my fellow Devon businesses who struggle to keep all their social media accounts up-to-date. I know I will find this feature very useful in my social media campaigns. I do not believe in “set and forget” as I believe one of the main aspects of social media is real interaction with your audience, but being able to schedule content ready for special events and promotions will save a massive amount of time.